Enterprise UX. Two words that can strike fear into designers, UXers, business developers and project leaders alike. Why? Because enterprise UX is difficult. Large organizations, whether national or international, have their own momentum and a change of direction can take months to implement. Years of layered complexity clog up software used in-house; while management sees the user as pretty far down the pecking order – below profits, clients and shareholders. But what do we mean by enterprise UX? Most people will hear “enterprise UX” and think of solutions such as Microsoft Office – and they wouldn’t be wrong in their association. But the concept of enterprise user experience has evolved to include many other factors. For example, having design rules and guidelines in place to ensure consistent representation of visual brand identity. 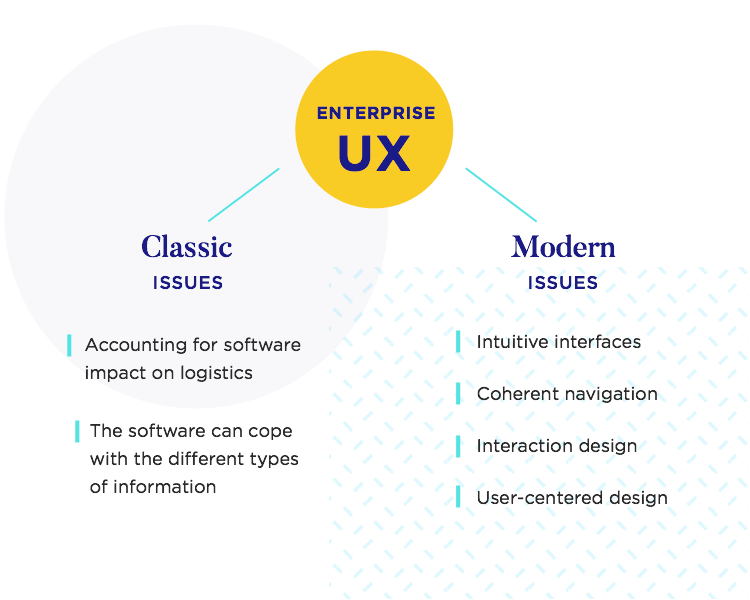 Since the very idea of enterprise UX has grown, we like to divide the concepts it includes into two large categories: classic and modern. Classic issues are those that have been around for decades – they tend to include accounting for software impact on logistics, or ensuring that the software can cope with the different types of information the company needs to insert in there. Modern issues surrounding enterprise UX include things that only recently started to draw the attention of enterprises. These include concepts such as intuitive interfaces, coherent navigation, interaction design, and user-centered design. But all this doesn’t detract from one simple truth. User experience is vital to enterprises today. Difficult, but vital. Big players across the board are recognizing that users now demand well-designed products, and UX is an integral part in delivering those products. If that wasn’t enough, enterprises are now starting to consider their own employees as the end-user for the software and tools the company uses. 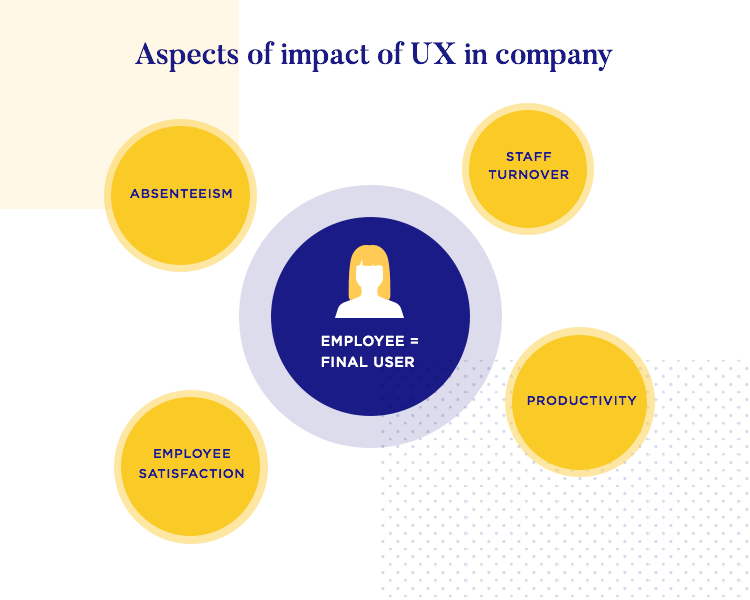 While this may seem like a small detail, it has massive implications for both software companies and the enterprises that use them – placing the spotlight on the concept of enterprise UX. It hasn’t always been like this. Historically, enterprise software has been pretty clunky. Many of you probably have anecdotes about troubles with Lotus Notes or Microsoft Office. And there are plenty of corporate horror stories about malfunctioning enterprise software too – back in 1999, candy company Hershey’s experienced the difficulty of enterprise UX firsthand. The American company learned that even if you focus only on the classic issues of enterprise UX, you can still miss mark. Hershey’s had the initiative to merge several operating systems into one ERP software solution, provided by SAP. However, after three years in development, Hershey’s established a deadline of 30 months for the implementation of the software (despite SAP’s recommendation of taking 48 months for the process). Just in time for their busiest time of year: Halloween. In order to make it to the deadline, certain steps were jumped in the testing phase. Shortcuts were taken that meant Hershey’s staff couldn’t test some of the system’s most critical parts. When the time came for the intense scheduling of orders and deliveries of Halloween, the software solution was just not capable of processing the data. Then-CEO Kenneth Wolfe had to make the unexpected situation public. The company was now incapable of delivering over 100 million USD of sales in time for the biggest holiday in the candy industry. A software solution that was meant to improve the operational efficiency of the company, had suddenly turned into an unusable supply-chain management nightmare. To make matters even worse, the computer system in question had come with a price tag of over 112 million USD. Shareholders were so worried and disappointed, that Hershey’s stock price fell over 8% under 24 hours. Here was the problem: regardless of whether the software failed due to hardware problems of a line of code gone wrong, proper testing of the software would have identified these issues. Instead, Hershey’s employees were surprised by a complete failure in the software they now depended on to do their job. Never forget that the employees were the end-users of that product – and the collapse of the system must have been anything but pleasant. The users felt the result of poor testing and poor implementation shortly after they started to use the solution. You need to make sure the software does its job, or allow the user experience to deteriorate until the solution becomes a big problem. If you want to read about the story in greater detail, check out this article. 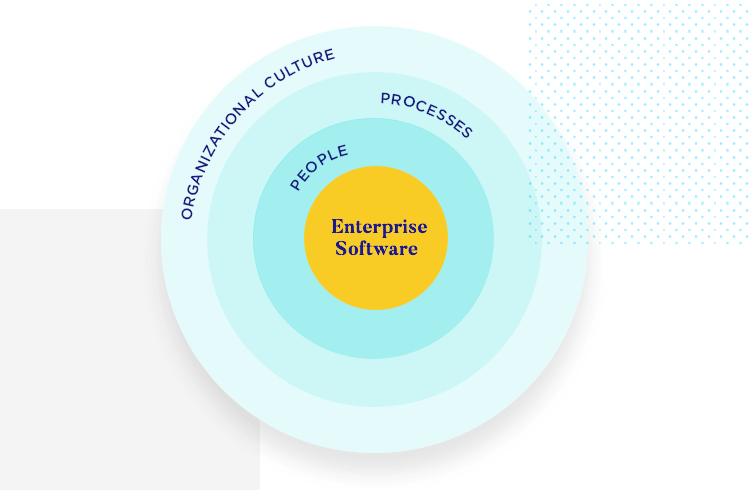 Implementing an enterprise software affects people, processes and organizational culture – suffice to say, there’s a lot at stake when you roll out an enterprise software. If the whole issue of enterprise UX wasn’t complicated enough, there’s the added complexity of implementation. Roll-outs can be very unpredictable, and the desired outcome might never be reached due to the sheer amount of intricate information and data they need to encompass. Sometimes, the software might not help your company push profits higher or improve on operational efficiency – especially if top management disregards quality UX as a key factor in the success of that software. Enterprise UX is easier with Justinmind. Large corporations have always kept their focus on getting all the required information into the software (which in itself poses a challenge), and getting the software up and running without harming profit margins. In this priority race, user experience was a clear loser. So why are enterprises increasingly turning a spotlight on good enterprise UX – be it in the software they produce, internal use, or in their own digital outputs and internal culture? 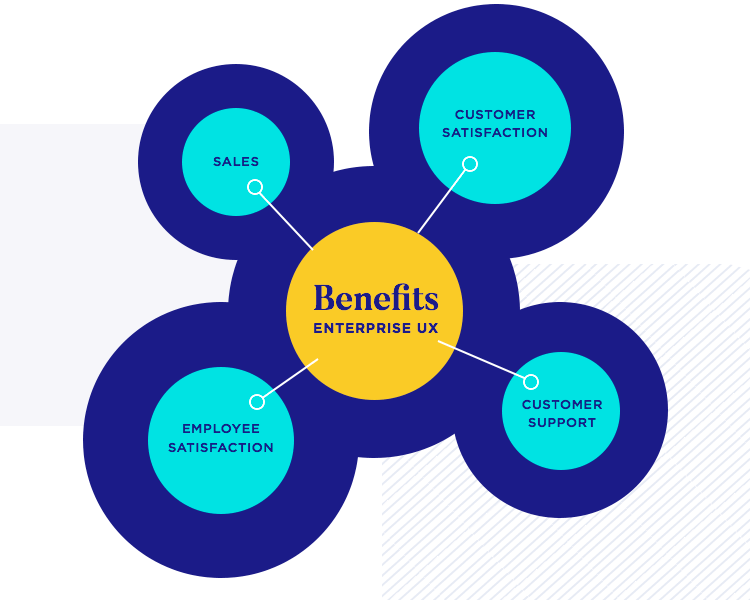 Let’s break down the 3 Ps of enterprise UX: profits, people, productivity. This is where the rubber meets the road: providing customers and employees with products that generate good user experiences adds value to one of the world’s biggest business sectors – information technology. As a consequence, programmers spend 50% of their time on avoidable rework. 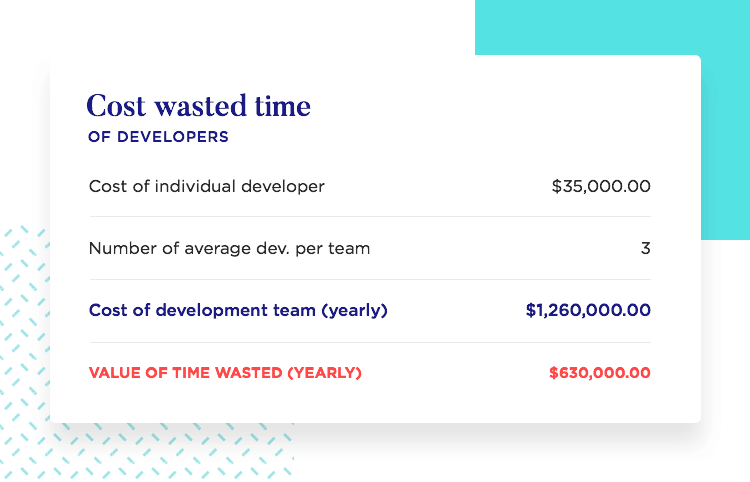 On top of that, the cost of fixing errors after development climb to be 100x more expensive than before development – with other factors, such as training employees to work with challenging interfaces raising costs. With numbers like that, one can easily see that work done twice represents a massive cost for the enterprise. The cost linked to poor UX design development skyrockets when testing isn’t thorough enough – errors that slip past the testing phase will evolve to become money drains once the product is developed. Bad enterprise UX comes with an unreasonable price tag. There’s no better way to stymie employee productivity than with crappy software; anyone who has seen colleagues organizing tasks on post-it notes then transferring them to a bad task-management program will testify to that. 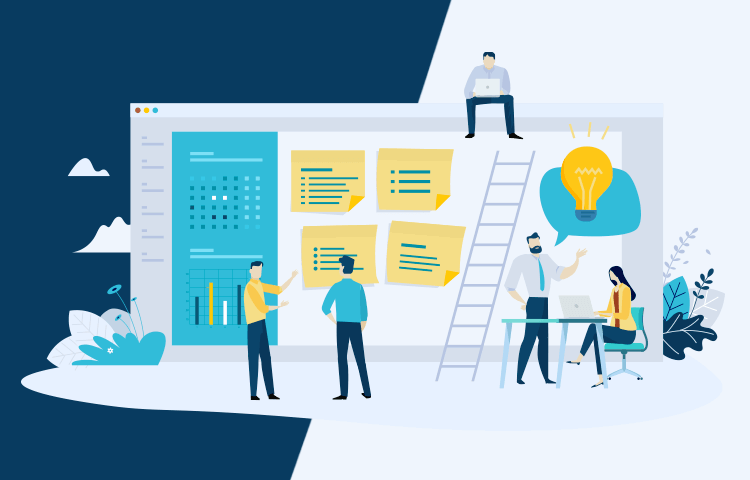 Productivity is a concept that most businesses are obsessed with – but many forget that good enterprise UX is a sure way to allow employees to do more with less. And we don’t mean just less time or money, but also less frustration and headaches for the employee. Companies should take the time to select software their employees can easily use, and that doesn’t make employees’ lives more difficult. This, in turn, should help boost job satisfaction and staff retention, as well contributing to better overall profitability by improving efficiency and requiring little training. A win-win. Automated usability testing means enterprises can do more pre-launch research faster, and with less spend than previously possible. For example, using a professional prototyping tool, prototyping an enterprise software solution and running tests before coding, allows software developers to iterate and rebuild faster than ever, dismissing designs that would hamper productivity. Check out how a team that was working on a video game came to realize that their productivity was being hurt by a bad tool – and decided to do something about it. Take the example of Slack, one of the most commonly used software for corporate communication. The team behind Slack, then-called Tiny Speck, was actually working to develop a video game before they ever considered creating a communication tool – but their team was spread around the globe, in different time zones. While originally, they found that some communication tools helped their workflow, they came to realize that no software available to them could actually suit all their needs. They had too many people, in too distant locations, and had an urgent need to be able to share their work online. The most popular chat tool available at the time, IRC, was difficult to use and its interface was extremely un-intuitive. Team members of Tiny Speck found that the use of IRC slowed them down, and proved to be a restraint on the productivity of the company as opposed to an improvement. A very steep learning curve, with not much of a pay-off. Needless to say that employees weren’t fans of the poor enterprise UX. Their solution was to create their own internal communication tool, with a particular focus on making it easy to use and even add some joy to daily work. New features and functionalities were added as they were needed by any of the developers in the company. 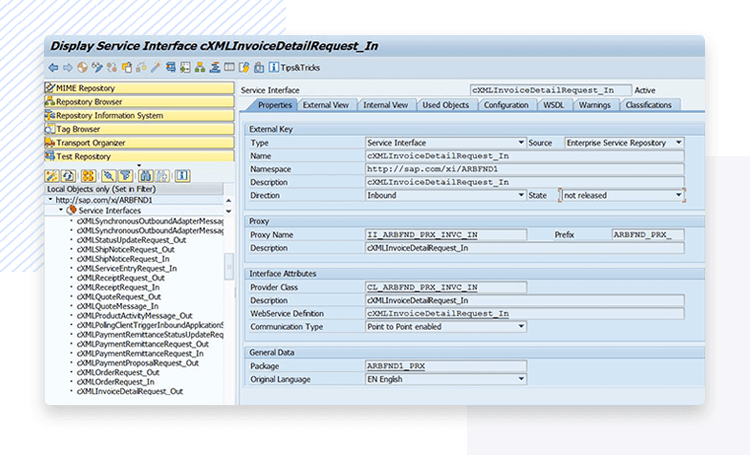 Example: As soon as any employee needed to find past messages, the development department added an effective search bar. A full two years went by before Tiny Speck decided to turn their internal enterprise software into a commercial product. In March 2014, Tiny Speck launched Slack and officially became Slack Technologies. 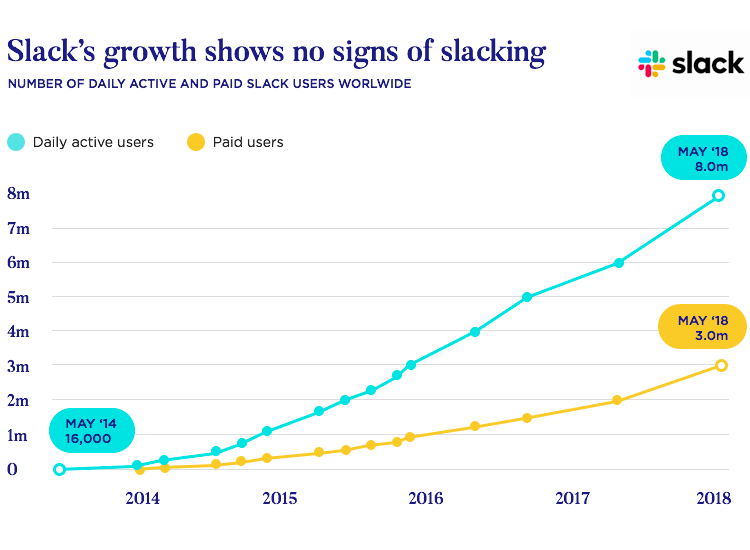 By October in that same year, Slack already had over 70,000 paying users – which represented an increase of 386% within 6 months. Both employees and managers alike were seeing that by adopting Slack, a lot of friction could be removed from office communication. 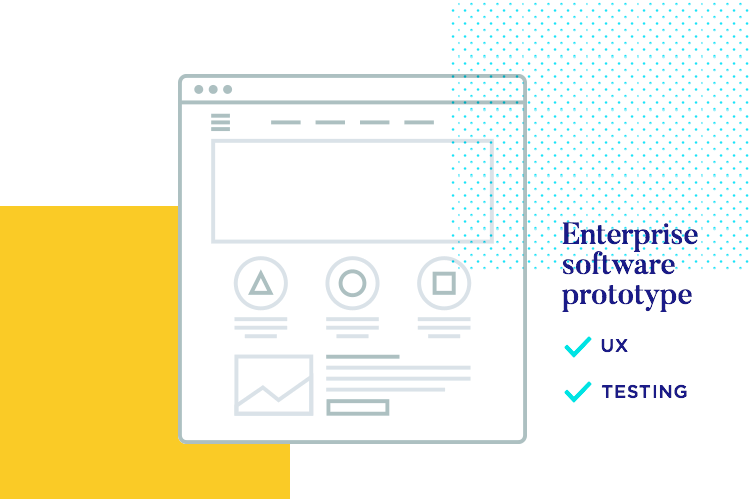 With basically no learning curve, no onboarding hassle, and very low prices – companies began to see the real value in a good enterprise software, and why enterprise UX matters. Today, Slack has over 3 million daily paid users. And did we mention that Slack is currently valued at over 5 billion USD? Read all about how Slack went from zero to hero in this case study. Yet another interesting paper was written by Susan Weinschenk, which states that by focusing on a few key metrics, it becomes much easier for companies to place a monetary value in any UX improvements it might have in store for the near future. 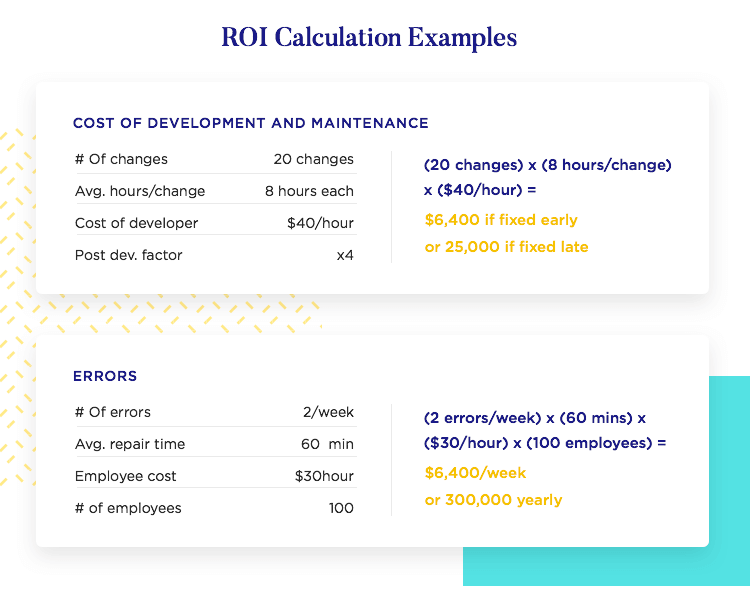 Using metrics such as conversion rate, drop-off rates, increased software usage, reduction in internal trainings, an enterprise can calculate the potential ROI of UX improvements. Her advice is, that all companies focus on the specific metrics we are all used to – number of errors or time saved, for example – so that we can grasp the impact any enterprise UX change will have. Instead of claiming that a change in UX will help the company website sell more, go for something along the lines of “if we change the navigation flow from a hamburger menu to a navigation bar, we can increase traffic on our product listings page by 30% and bring sales up by 20%”. From Weinschenk’s paper on the business side of UX. Good UX can manifest itself in many forms, be it in the shape of losing the fight against the competition due to poor UX, or improving your website UX and reaping that sweet profit your UX designers sowed. You can read Weinschenk’s paper entitled Usability: a business case for more details. Take Bank of America. This bank came to realize that it was lagging behind its main competitors when it came to online enrollment. The enrollment process was difficult, resulting in many users throwing the towel before the finish line. Employees began to analyze every step of the process in order to identify the problem, managing to locate each problematic step users went through – and hated. The bank set the key metric as the percentage of users that finished the enrollment process, in comparison to the users that started it. But what was the value of all those finished enrollments? Lucky for Bank of America, their financial department already had found a value in American dollars for each new online enrollment – a value which considered, both the reduced service cost and the improved customer loyalty. 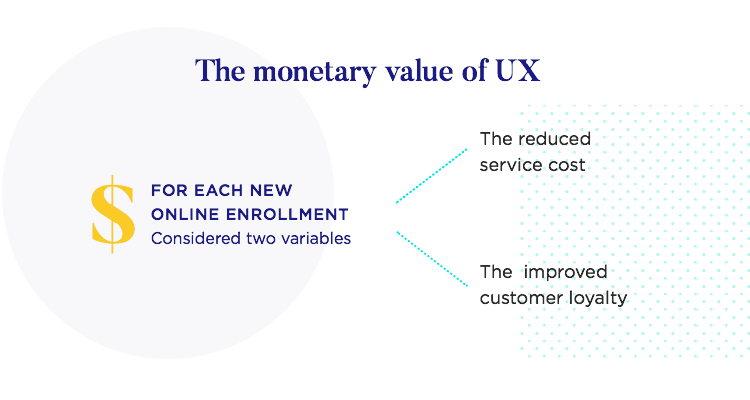 With a real monetary value given to its UX design quality, the bank was better suited to pitch and predict the real value behind any UX initiative in the future. Making a case for that investment becomes easier when you can present real figures, or an estimated pay-off at the end of the road. Start designing apps for free with Justinmind. 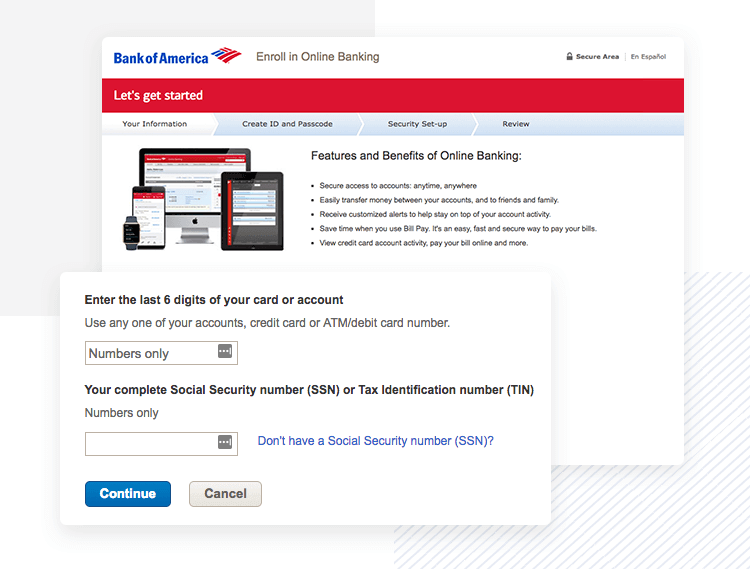 After only one week with the newly redesigned enrollment process went live, Bank of America saw the percentage of users who finished the enrollment double. The monetary value it had originally attributed to the redesign project was surpassed by a large margin. UX-centered software and digital platforms have a tangible, measurable impact on ROI. 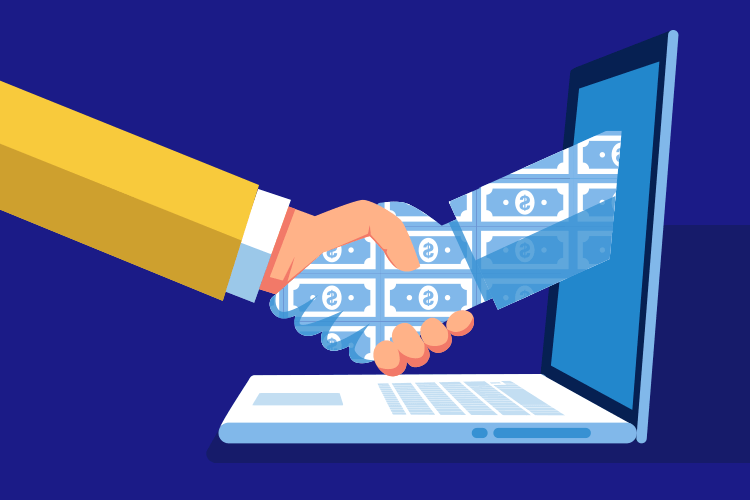 In a paper written by senior UX architect Jim Ross, we have a compelling estimate that for every dollar invested into better UX, return can go from 2 USD to 100 USD. The paper goes on to note that enterprise UX will have a huge impact on sales, customer satisfaction, customer support, employee satisfaction and many other aspects of the business. Ross goes to say, that both clients and employees expect a good user experience nowadays, and failing to reflect that expectation in your software is a mistake. You can find out more directly from Jim Ross in his paper entitled The Business Value of User Experience. Ross does a great job at pointing out that for consumer applications, ensuring good UX is key in terms of sales and overall revenue. In contrast, businesses need to secure good enterprise UX, because of its direct impact on productivity, employee satisfaction, absenteeism and staff turnover – to name just a few. People everywhere now use apps and websites with world-class UX every day of their lives, and any enterprise software that doesn’t meet this standard is going to look and feel prehistoric. Poor usability and un-intuitive interfaces are no longer acceptable by any means – which is true both for clients and employees as users. First, enterprise employees. These are the guys who’ve traditionally had to suffer crummy software 9-5, Monday to Friday. Bad enterprise UX all around – for the simple reason that large companies didn’t consider their own employees to be the user. A C-level executive decided on an ERP software based on price over usability. If the software was sub-par, employees simply found work-arounds, or worked more inefficiently. Avon is a beauty products retailer, relying on direct marketing as the means to move its product door-to-door. They don’t have employees, so much as “representatives” who sell Avon products. In 2013, Avon turned to SAP in order to create a new order and purchasing management software, that was meant to massively improve efficiency in the company. The plans were well-intentioned, with a focus on making the software work efficiently with the ultimate goal of implementing the program globally. But those plans changed shortly after the rolling out of the software – initially done in Canada. The software itself was working according to plan, but the sales force hated it. As it turned out, the system was so disruptive in salespeople’s daily lives, and the user experience so burdensome, that representatives started to quit their jobs. Avon found that people would rather look for another job than learn to use a piece of software they hated. 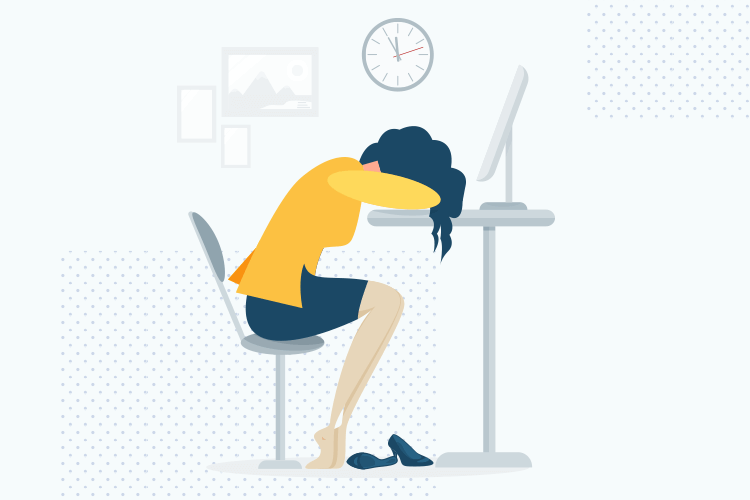 For Avon, losing their team of representatives was a true disaster – their whole business model relied on these salespeople. Ben Kepes, with Forbes, found that part of the problem was that Avon’s sales people weren’t digital natives. These weren’t people who were up to date on current technology, and they were asked to adopt a software that had quite a learning curve to it – unleashing the anger of frustrated and disappointed sales representatives. The cost of the SAP software that Avon tried to implement had a price tag of 125 million USD, and took four years to develop. That’s a lot of time, money and effort to waste on a software that could never be successfully adopted by the company. Ouch. You can read more about the Avon enterprise UX fiasco with this Forbes article or with this Wall Street Journal one. The implications for enterprise UX design teams? It’s not the sales pitch to the purchasing department that matters anymore, but the experience of the end-user. As far as customer experiences go, when customers jump onto an enterprise product, be it an e-commerce site, a cloud-powered ERP or an app, they expect to be painlessly onboarded, to be able to customize their experience without calling in the IT department, and to figure out the platform intuitively. In his study, Jim Ross was absolutely right in his claim that employees have come to expect enterprise software to be as easy to use as consumer applications. Building UX into the software development life cycle and into the fabric of an enterprise positively impacts on profit, people and productivity. But the real lesson here is that enterprise UX can be a case of make or break for a business. Enterprise strategies are no longer focused solely on functional requirements, and now incorporate the end user. Enterprises that don’t have a UX strategy and process up and running will want to start on the next step – building an in-house UX team, covered in the next chapter.